I was all set and ready to try out the new Japanese-run Kazu on Hastings when I made it to their door only to find out that their hours have changed and they are no longer open Tuesdays at lunch. First, they try to inconvenience me by not opening on Mondays, and now this. A bit disappointed, I decided to walk to Kilala (their Unagi Battera was unforgettable) until I simultaneously came across Take Sushi and a very cold breeze. I took one look at the remaining distance to Kilala and decided to cease pursuing the seemingly daunting task. Instead, I stepped into Take, a Chinese-run restaurant that I have visited several times in the past and was quite pleased with. They have renovated their menu, both physically and in price. The menu items were pretty much identical compared to the previous menu, but a few of the prices ticked up. 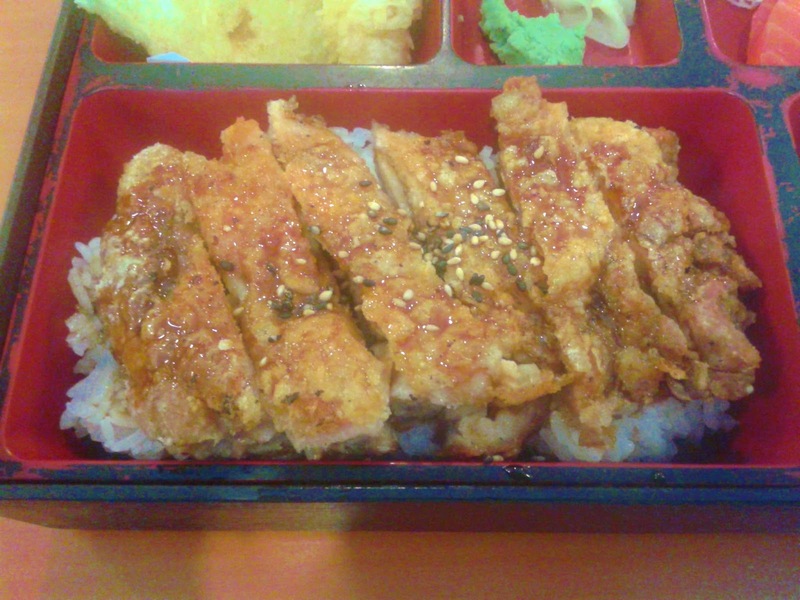 They have a good variety of rolls and robata, as well as some very good deals on the lunch boxes. For some reason I do not know, the music that they play is always rather depressing. 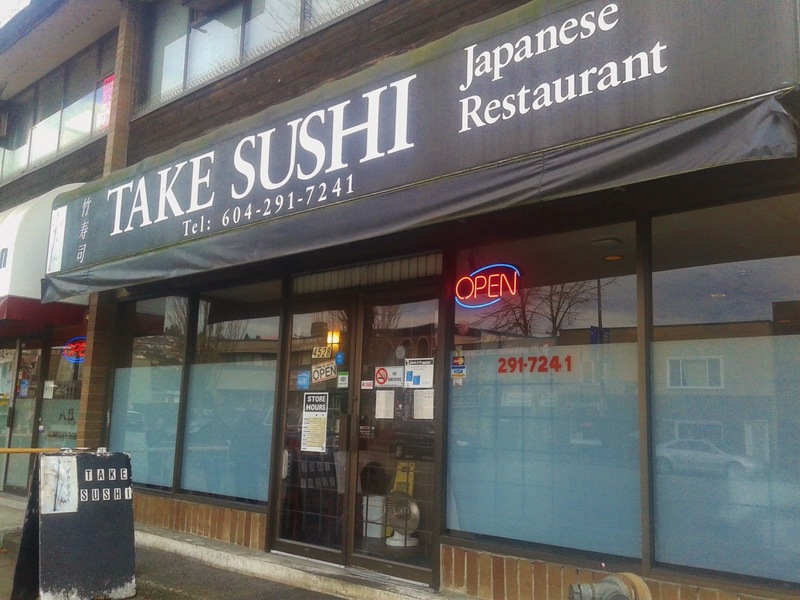 I can't help noticing it every time I have sushi at Take. I don't remember there being any research saying that depressing music makes food taste better. I first ordered the Sashimi Box, which came with Miso Soup, a Salad, Tuna Sashimi, Salmon Sashimi, Chicken Teriyaki and an Appetizer Tempura (5 pieces). At first glance, I found the presentation quite neat, which was good to see. 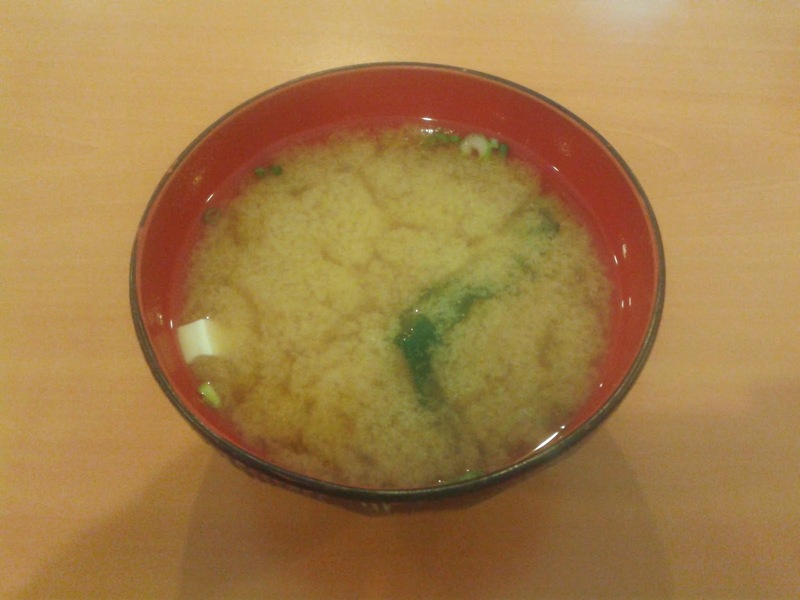 The Miso Soup was served hot and garnished with tofu, green onion and seaweed. I found it a tad on the saltier side, but otherwise, it was pretty standard. The salad was dressed with a bold, citrusy vinaigrette which had a peppery zing to it. The vinaigrette was a bit dry (all the moisture gathered at the bottom), but the lettuce and cucumber were chopped into nice bite-sized pieces. Overall, the sashimi was decent and fresh. The Tuna Sashimi could use more thawing time, as it was not very soft in the center. It had a nice mildly salty flavour to it though. 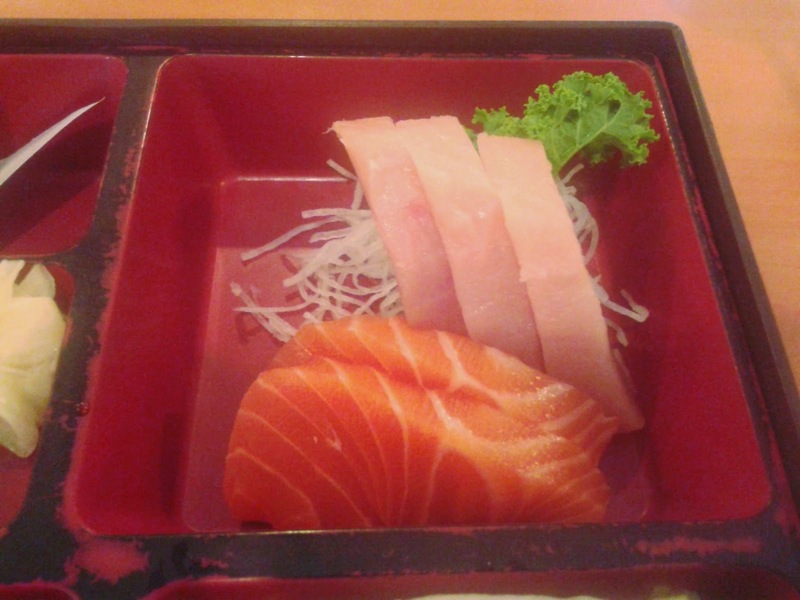 The Salmon Sashimi had a very smooth texture and was sliced to the perfect thickness. The tempura came with 5 rather large pieces, each coated with a flaky layer of batter which exhibited some crispiness. The Yam Tempura was sweet and cut not too thick. 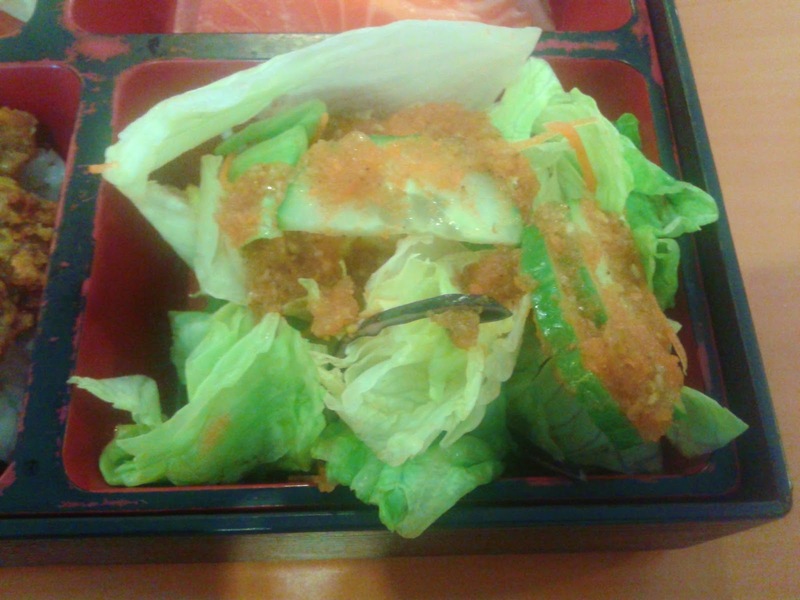 The Kabocha Tempura was quite soft and the moisture inside it was well-preserved. The Carrot Tempura had a massive diameter and was sliced thin, but the batter this particular piece was much too thick. 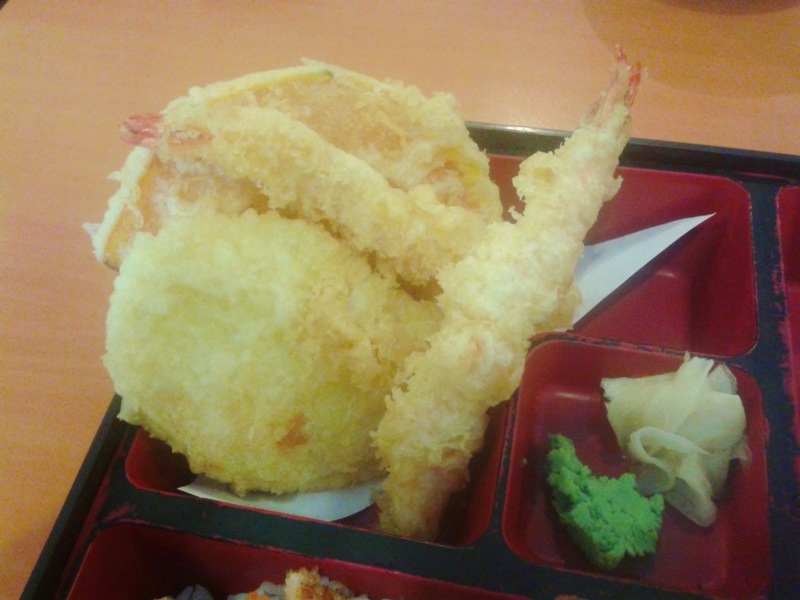 The Prawn Tempura (2 pieces) had a rather thin piece of shrimp and the batter was a little soggy in some parts. The pan-fried chicken on the Chicken Teriyaki was a little overdone, but the chicken was tender and had a layer of skin thin enough so that it wasn't hard. I also enjoyed the addition of herbs and sesame seeds which gave it a more distinct flavour. The rice, like the chicken on top, was on the drier side. The Take Roll (not part of the Sashimi Box) is one of their special rolls and it was made with unagi tempura, smoked salmon, avocado and lemon. There was very good balance and harmony among the ingredients. 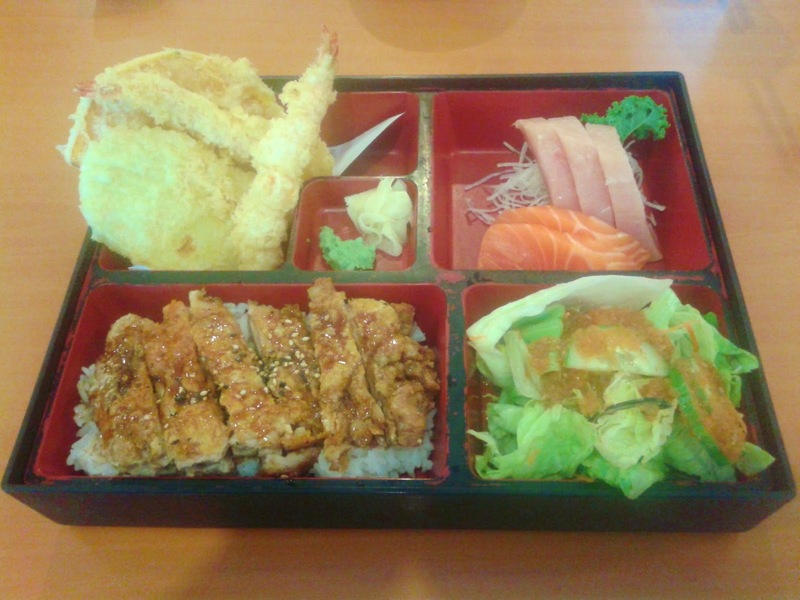 I was able to taste both the salmon and the unagi even though there wasn't an especially large amount of either one. The roll is not large, but very neatly crafted. 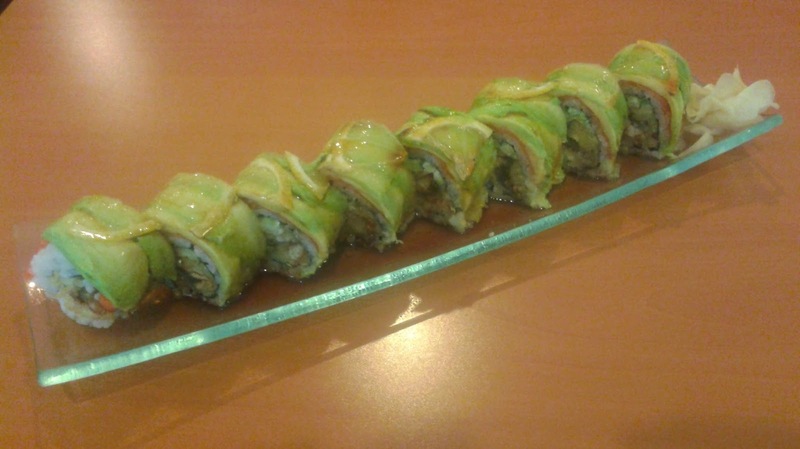 The addition of mayonnaise inside the roll allowed for a softer and creamier interior, and I also liked the slight crunch contributed by the unagi tempura. An extraordinarily thin slice of lemon was added to the top of each piece which gave the roll an acidic hit.